Who hasn't dreamed of turning off the computer, packing a suitcase and going on a round-the-globe adventure? You now have the chance to do it in style with a package that takes in all 962 Unesco World Heritage Sites - should you have a 24-month window in your diary. Veryfirstto.com is offering the voyage of a lifetime, which will take in everything from the Taj Mahal in India to Cambodia's Angkor Wat temples. 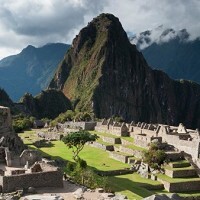 Egypt and Mexico's pyramids, China's Forbidden City and Peru's Machu Picchu are also on the list of stop-offs but people should consider arranging travel insurance before the magical mystery tour gets under way. In Vietnam you will visit Halong Bay, in the US you'll stop at the Grand Canyon, in Jordan you will see Petra, and where Argentina and Brazil meet you'll see the incredible Iguazu Falls. Organising the trip is luxury travel firm Hurlingham Travel, whose managing director Andrew Barker said: "This is certainly the most exciting trip we have ever managed, and is the most remarkable travel adventure imaginable."